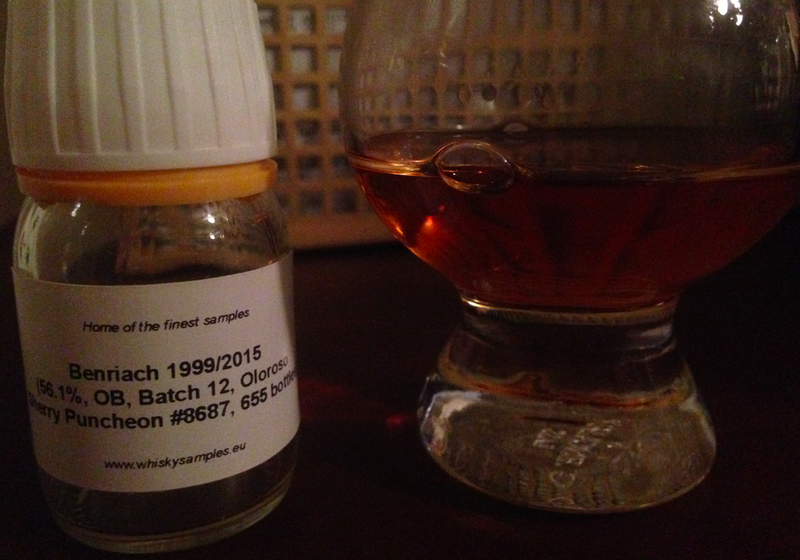 Distilled: 8/12/1999 Bottled: 06/2015; Oloroso Sherry Puncheon Cask #8687, 655 bottles. Somebody just told me that my I have "the best whisky palate of anyone on the internet." Now, granted, that was me talking to myself, but one thing's for sure: I'm so generous to keep sharing my incredible genius with you, one review at a time. So, in keeping with the BenRiach theme, here's a non-peater single-cask from Europe. It smells like a high-rye bourbon. Blind, I might have guessed it was a Four Roses. And it kind of tastes like Four Roses too, how odd. It's all over the place, with a floral/perfume spice, some graham crackers, and a dry finish. There's some moderate sulfur here, so if you're sensitive to that, you'll only taste matchsticks, burnt plastic and exploded fireworks. It's a bone-dry sherry affair, not sweet at all. A fun cross-over spirit for bourbon-lovers. 85 points/B. I wouldn't rush to get a bottle, but it's unusual and worth a try if you can tolerate the sulfur, as I can.